Amazon has unveiled three new Kindle Fire tablets at a recent event in California, including two models which will be available to buy in the UK for the first time this October. The Kindle Fire, now available in HD, comes in two different sizes; either with a 7in screen or an 8.9in one – which at the moment is only being released in the US in November. The 7in Kindle Fire HD with 16 gigabytes of storage will cost £159 in the UK, and the standard Kindle Fire will be sold at £129. Both will be available for delivery from 25th October. By selling its tablets at these prices, Amazon is heavily undercutting Apple, who sells its latest iPad from £399. Amazon revealed its first Kindle Fire had captured 22% of the US tablet market, which is very impressive considering the U.S is the only country it was sold in. Chief executive of Amazon, Jeff Bezos, said the HD models featured stereo speakers, an HDMI port and a laminated touchscreen to reduce glare in sunlight (one of the few criticisms of the iPad). The Kindle Fire also contains two wi-fi antennas and Mimo (multiple-input and multiple-output) radio wave technology to improve connection to the internet. The larger model can be bought with 4G connectivity at a higher price in the US, which may frustrate UK consumers who lust after a tablet with 4G. The question arises again – will the Kindle Fire steal some of the iPad’s shine? Technology analysts believe the Kindle Fire HD could pose a serious threat to Apple and its infamous iPad. “This could easily be the product that beats the iPad particularly for those of us who are readers, easy and innovative in design and use, with unique features like X-Ray which allows you to become far more intimate with what you are reading,” said Rob Enderle, principal analyst at the Enderle Group. However, not all industry experts are convinced the Kindle Fire has what it takes to compete with the iPad. “On paper the Kindle Fire HD is a good product but we shouldn’t get carried away,” said Chris Green, principal analyst at Davies Murphy Group Europe. So, what do you think? 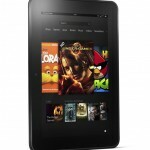 Do you think the Kindle Fire launching in the UK has a chance of real success?